Owning a pet teaches values. Even toddlers can learn about caring for a pet by watching the way you are kind and gentle to your pet. Children as young as two years old can lend a hand with smaller tasks such as pouring pet food or water into a dish or giving treats. Most 12-month-olds will want to interact with pets and should be learning how to pet nicely (with an open hand) at this age. My 18-month-old son Chase knows how to play with our cats with the fishing pole toy. It’s great to see the look on Chase’s face when he gets one of the cats to grab the toy! If your child is a little older, he or she might be able to brush the dog or cat and maybe even scoop the litter box. Guinea pigs and fish are also great pets, and even a young child can pitch in and help feed these smaller pets. At any age, your child will realize that pets need the same things we need — food, water, shelter, love, which will teach him lessons about empathy and compassion. Owning a pet is good for your child’s health. Experts say that children who grow up with pets are less likely to develop common allergies due to early exposure to certain bacteria. And some studies show that pet owners tend to get sick less often. Another benefit to pets — brushing, patting, or stroking a furry creature can lower stress levels. Caring for a pet also helps keep children more active — especially if your pet happens to be a dog. On average, dog-owning children spend 20 more minutes a day being active than those without a dog. Despite all these benefits, potential pet owners should acquire a pet because they want the lifelong relationship; the added bonus is the physical and mental health benefits that come along with it. Pet ownership shouldn’t be entered into lightly as it is a big responsibility. Once you are ready for a pet, visit www.petfinder.com to find your local animal shelter or rescue group and adopt rather than shop for a pet. There are literally millions of homeless pets just waiting for the right person to come along. Stop by an animal shelter today, and improve the life of a homeless pet as well as your own! Animal Shelter Assistance Program, aka ASAP, is having an adoption fair on Saturday, December 10, 10 a.m.-4 p.m. Fifty percent off all adoptions! ASAP is located at 5473 Overpass Road in Goleta. Check out this link to watch a video of kitties in action at ASAP. On Sunday, December 11, 1-9 p.m., ASAP is having a “Rockin’ for the Kitties” benefit at the Creekside, 4444 Hollister Road in Goleta. It will be a chance to kick back and have fun — music, raffle items, games, snacks, and a cash bar. There is a lineup of great bands that will play all day long, BBQ chicken dinners will be sold, and there will be a raffle every 30 minutes. The door fee is $10; every penny goes to support ASAP’s critical work of saving cats’ lives! The following is included in the adoption fee at ASAP: spay or neuter surgery, flea treatment, vaccinations, microchipping, and health evaluation, including testing for feline leukemia (FeLV) and feline immunodeficiency virus (FIV). Cats thought to be 10 years or older receive a full blood panel evaluation, thus assuring that the cat is indeed healthy and adoptable, Medical and drug coverage through ASAP’s vet for two weeks beyond adoption, if necessary. Temperament evaluation and cat carrier (you can save the county money by bringing your own). Second Chance Cocker Rescue, Inc. (SCCR) and the Pet House have invited K-9 Placement and Assistance League, Inc. (K-9 PALS), and Cold Noses Warm Hearts, Inc., to its annual Holiday Street Fair and Adoption Event at the Pet House in the Calle Real Shopping Center in Goleta. During the event, people looking to adopt a dog this holiday season can visit the pet store to see many wonderful dogs for adoption. The three nonprofit organizations will have about 20 small-, medium-, and large-breed dogs for adoption available to meet at the Pet House. Every dog that gets adopted on the day of the event will go home with a handmade fleece blanket. All the rescue groups and Animal Shelter dogs are spayed/neutered and have current vaccinations. Adoption fees for each organization vary. Santa Barbara County Animal Shelter dog adoption fees will be discounted 50 percent; K-9 PALS generously sponsors four free dog behavior training sessions as part of the adoption for County Shelter dogs. The event takes place Saturday, December 10, from 10 a.m. to 3 p.m. at the Pet House, 5871 Calle Real, Goleta, next to Trader Joe’s. There will also be a bake sale, jewelry and pet item sale, strolling carolers, and a wandering Santa Claus. 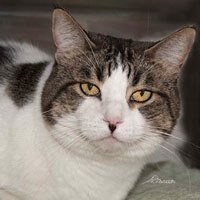 Emma is a big, beautiful feline who is mostly white with a brown tabby back and mask and a ringed raccoon tail. This 7-year-old kitty is a calm, quiet, and cautious lady looking for a safe, stable home to curl up in. She loves chin rubs and her favorite pastime is napping. With her pink nose, she will need to live indoors to protect her from the sun. Gets along with other cats. The following is included in the adoption fee at ASAP: spay or neuter surgery, flea treatment, vaccinations, microchipping, health evaluation, including testing for feline leukemia (FeLV) and feline immunodeficiency virus (FIV). Cats thought to be 10 years or older receive a full blood panel evaluation, thus assuring that the cat is indeed healthy and adoptable. Medical and drug coverage through ASAP’s vet for two weeks beyond adoption, if necessary, temperament evaluation and cat carrier (you can save the county money by bringing your own).